Hello and Happy Tuesday! I've been a bit under the weather the last few days but am finally beginning to feel a bit better! 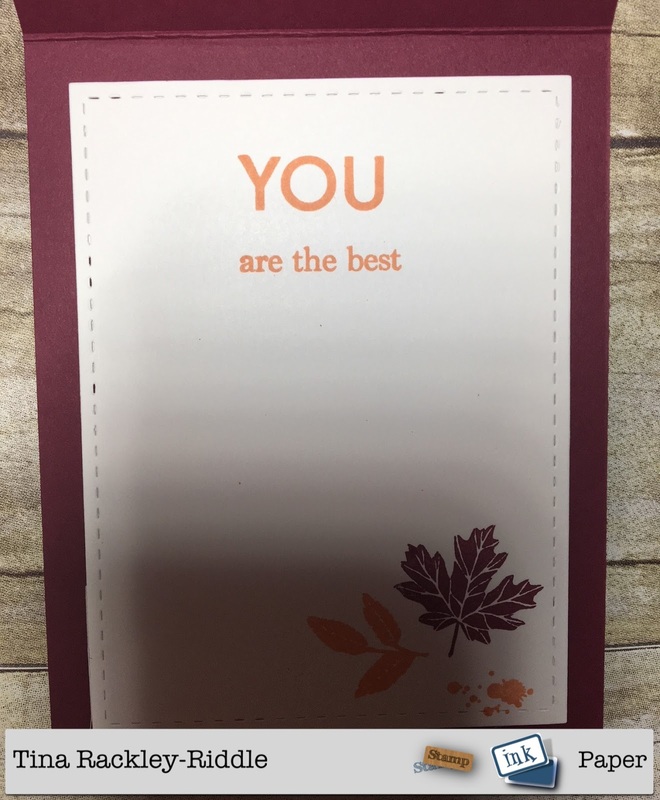 I thought about taking the week off from crafting but I loved the new Stamp, Ink, Paper Challenge so much I decided to get in gear and get a card made! 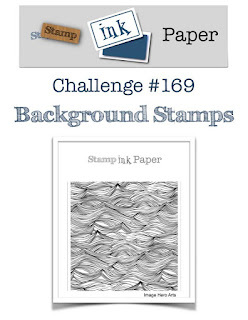 I LOVE background stamps and one of my new favorites are the turnabout background stamps from Concord & 9th! 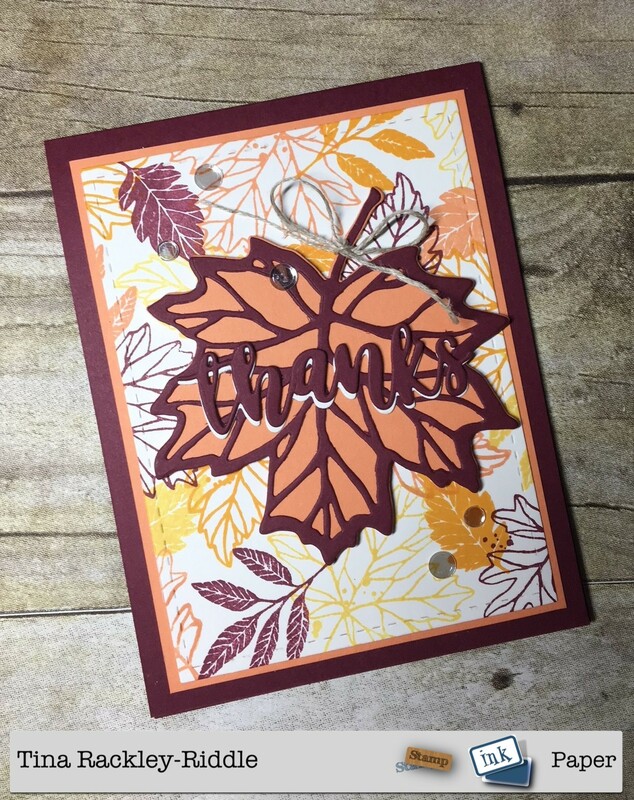 This Thankful Leaves Turnabout and coordinating dies are awesome!! My stamping was done on SU Whisper White Cardstock with Merry Merlot, Grapefruit Grove, Mango Melody, and Daffodil Delight! The stitched panel was adhered to a Grapefruit Grove layer and then put on a Merry Merlot Cardbase. The leaf was cut in the same colors. 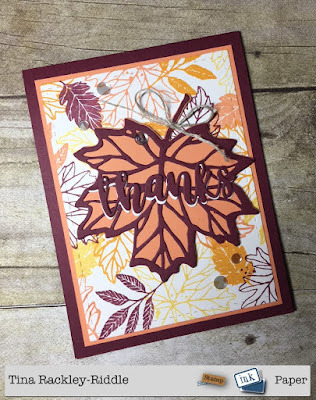 The "thanks" die cut sentiment is from the Fabulous Phrases Die set from Concord & 9th. I cut it out in Merry Merlot twice and backed it with a layer of white so that it would show up more over the skeleton leaf. The You are the best sentiment on the inside is from a Simon Says Stamp Stamp Set called "You Matter" I added two of the leaves and a paint splatter stamped at the bottom right in Merry Merlot and Grapefruit Grove to finish this one off. September Scrapbook Sunday Blog Hop - The First!